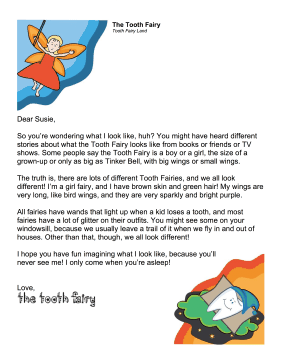 Tooth fairies may not have a consistent public image, but this printable letter describes the physical appearance of the tooth fairy. So you're wondering what I look like, huh? You might have heard different stories about what the Tooth Fairy looks like from books or friends or TV shows. Some people say the Tooth Fairy is a boy or a girl, the size of a grown-up or only as big as Tinker Bell, with big wings or small wings. The truth is, there are lots of different Tooth Fairies, and we all look different! I'm a girl fairy, and I have brown skin and green hair! My wings are very long, like bird wings, and they are very sparkly and bright purple. All fairies have wands that light up when a kid loses a tooth, and most fairies have a lot of glitter on their outfits. You might see some on your windowsill, because we usually leave a trail of it when we fly in and out of houses. Other than that, though, we all look different! I hope you have fun imagining what I look like, because you'll never see me! I only come when you're asleep!